When I first met my husband, Melinda’s dad, he melted my heart by playing Children of Sanchez, by Chuck Mangione, on the piano. I loved this song from the first time he played it, and I have recently rediscovered it. It brings back to me all the familiar feelings from long ago– before I was married and before our three children were born. At the same time, this beautiful song has now taken on new meanings as life experiences have piled on over the years. My love for children has always been strong, but having the experience of being engulfed into the world of childhood cancer has only made that love stronger and more powerful. My contact with children fighting cancer and families and caregivers over the past few years has impacted my life in ways I will forever be grateful for. I credit them with teaching me to look at and value the Ends of the Spectrum of Life. At one end is the ultra-meaningful and at the other is all-out-silliness, whose only meaning is pure joy. What lies in the middle is the mediocre of life and what lies at each end is what life is all about. For those leaders in the childhood cancer community who take on the challenge of pushing forward for awareness, research and cures for our “fruit of humanity,” I thank you. If we don’t take care of our children, our “fruit,” we are nothing but empty and barren. 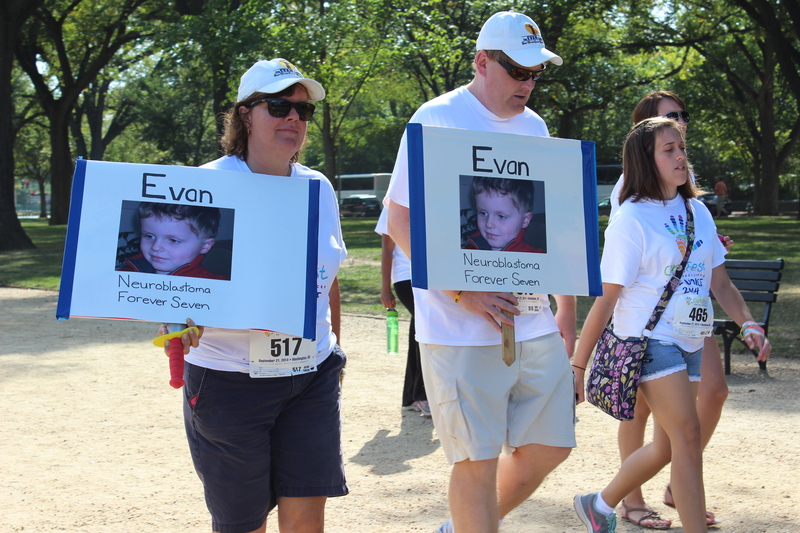 Every child really does belong to “mankind’s family.” For too long, our society and our government have turned away from viewing the gripping and horrid realities of childhood cancer. Cancer is the number one disease killing children in our country. Seven children die each day. Two new drugs have been developed specifically to treat childhood cancer in the past two decades. Two. Children need progress. 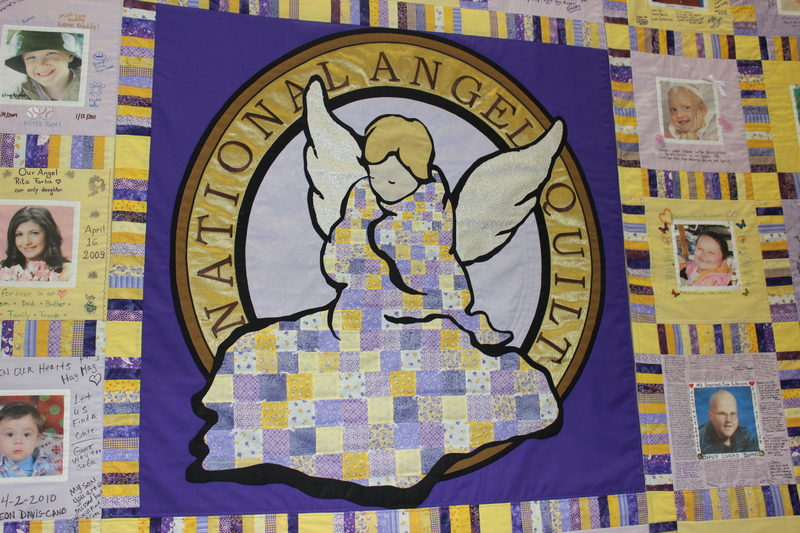 Time is not a luxury in the world of children fighting cancer. Our Sweet GG did it! 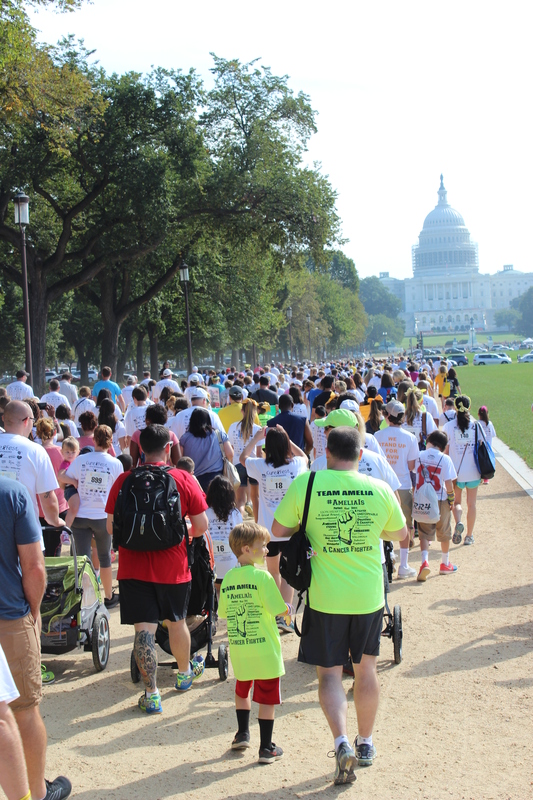 Thirteen and a half months after Gabriella died she moved our Congress to come together for our children battling disease. Congress “stopped talking and started doing”! 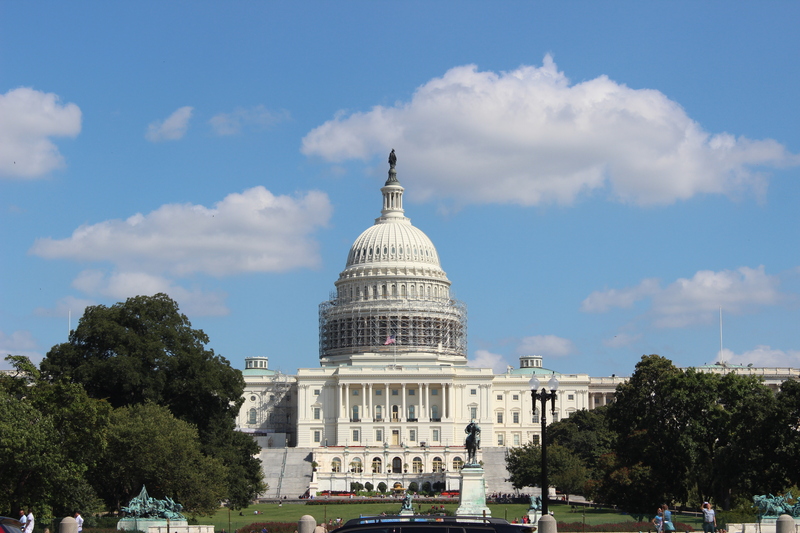 The Gabriella Miller Kids First Research Act has made it into the government funding Bill that the House and the Senate will vote on THIS week!! The section of the Bill that includes the GMKFRA is 177 pages long. The link below includes a summary of each section of the legislation. Not only is the GMKFRA included in the legislation but it is prominently featured in the three page summary attached below! 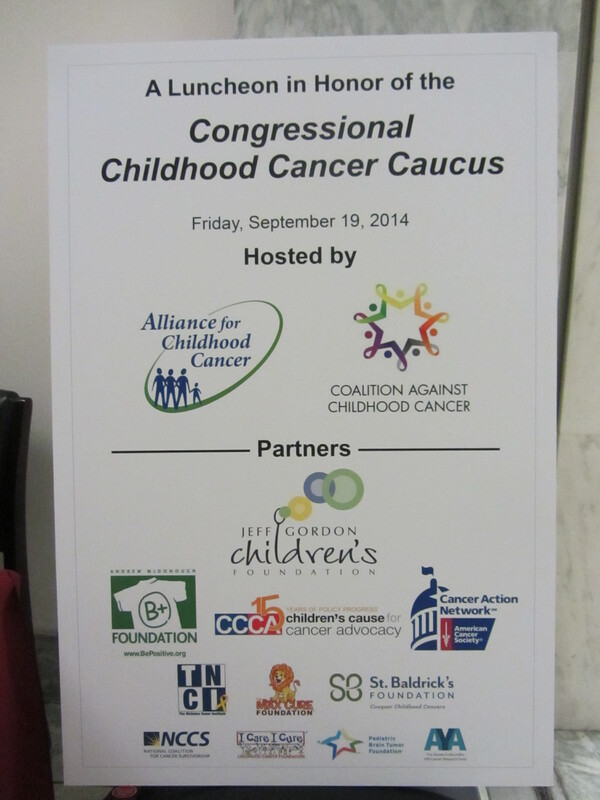 Let’s encourage our elected leaders to continue to sharpen their focus on childhood cancer. 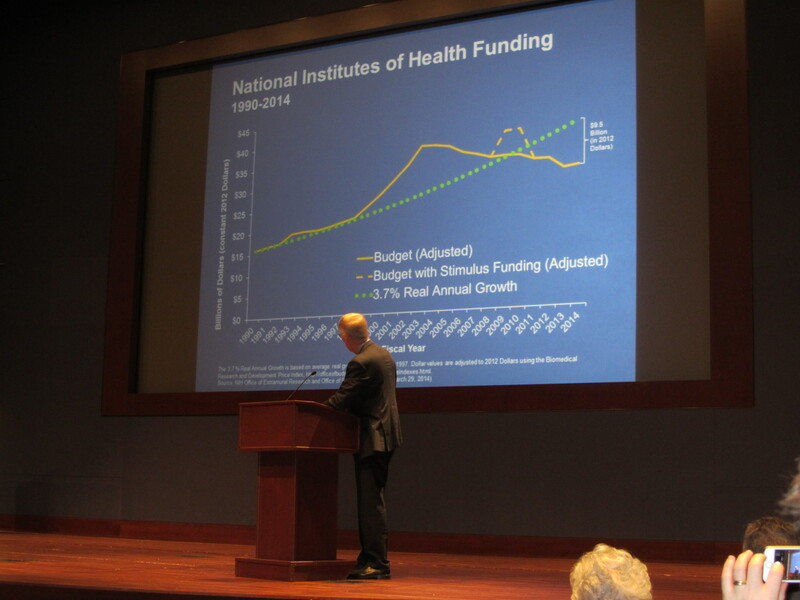 Thank them for their votes this week to include GMKFRA in the FY 2015 Omnibus. After two days filled with inspiration in Washington D.C., a third followed. 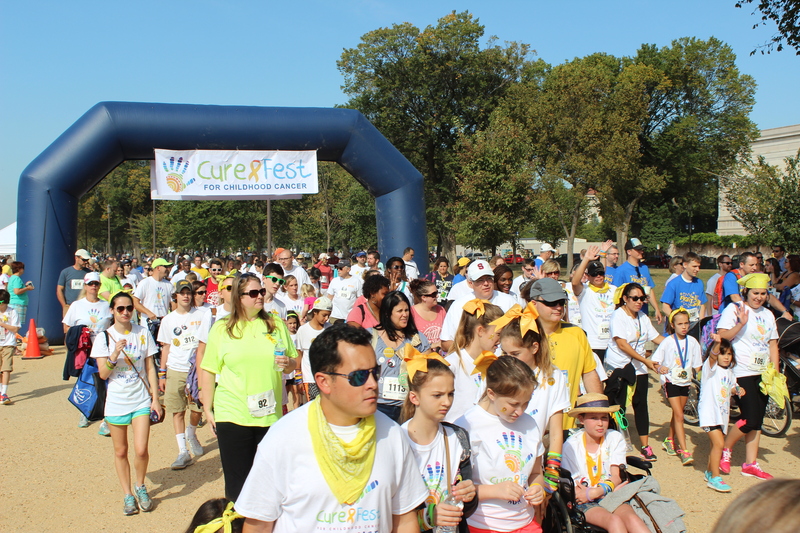 CurefestDC 2014 began at 9 am on Sunday, September 21st on the National Mall. My decision not to brave the “waters” of the dreaded metro by myself on this morning proved to be a good one. I gobbled some breakfast in a taxi on the way and arrived with a full belly and a happy heart. Festive is the word I would use to describe my first impression. My second impression was thankfulness for all the people who came, all the people who worked to create the event, and all the volunteers who donated their time to put this enormous event together. The setting for CurefestDC on the National Mall made everything that was there and everything that happened a notch or two more epic. Backdrops of the Capitol Building and the Washington Monument have a way of doing that. I understand there were more than 75 foundations present under the white pop-ups lining the mall. This was a day for the kids. I loved seeing kids scurrying around collecting as many wristbands as they possibly could. They hugged each other, sat on each other’s laps, walked, danced, and some even spoke. 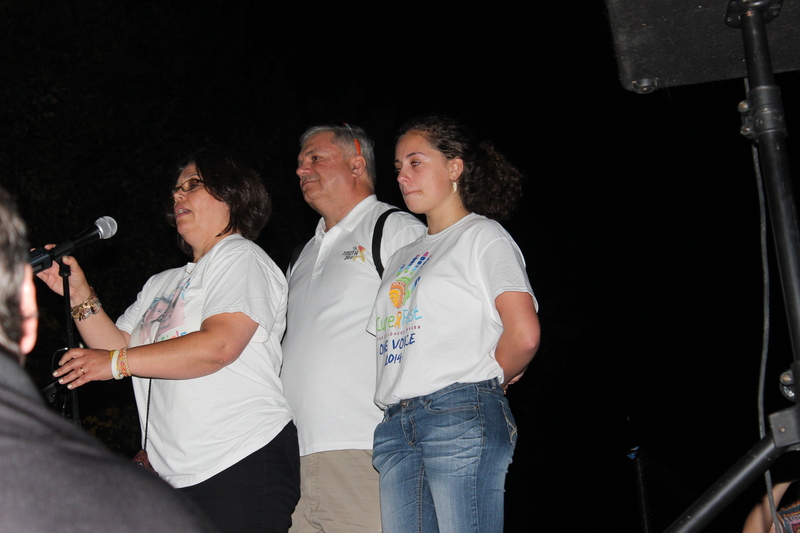 Survivors and siblings were honored and received special gifts. 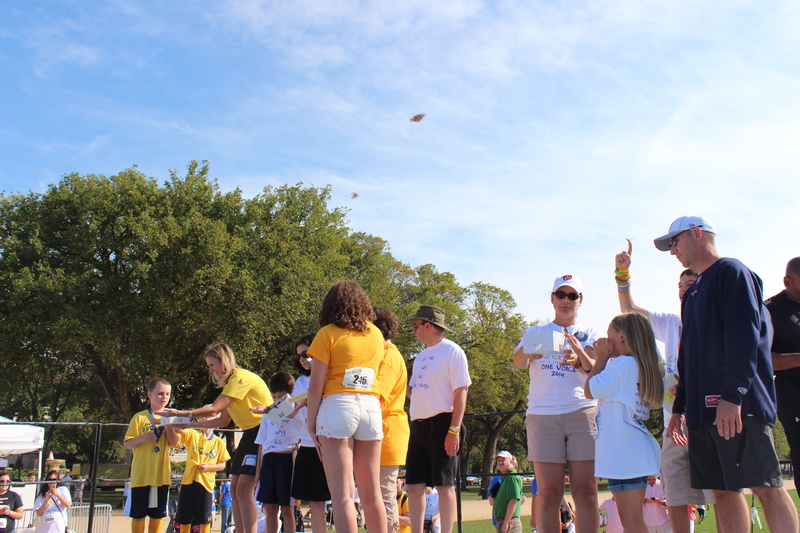 One of the most fun and heart-warming times of this day was a butterfly release. Families were given boxes to open and free the butterflies inside. The look of wonder, awe, and joy on the kids’ faces was alone worth the trip to D.C. Before opening the boxes, Ellyn Miller told the crowd, “These butterflies are for all of our kids.” With that, they gave their boxes a kiss, then opened them up to reveal the life within. The camaraderie present was something so strong that it seemed possible to physically touch it. 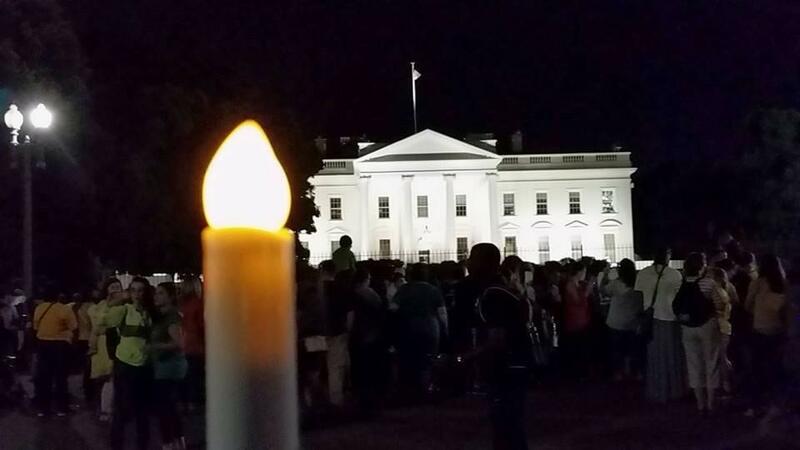 The gorgeous somber and reflective tone of the night before at the White House transformed into a tone of courage, love and purpose– even joy. 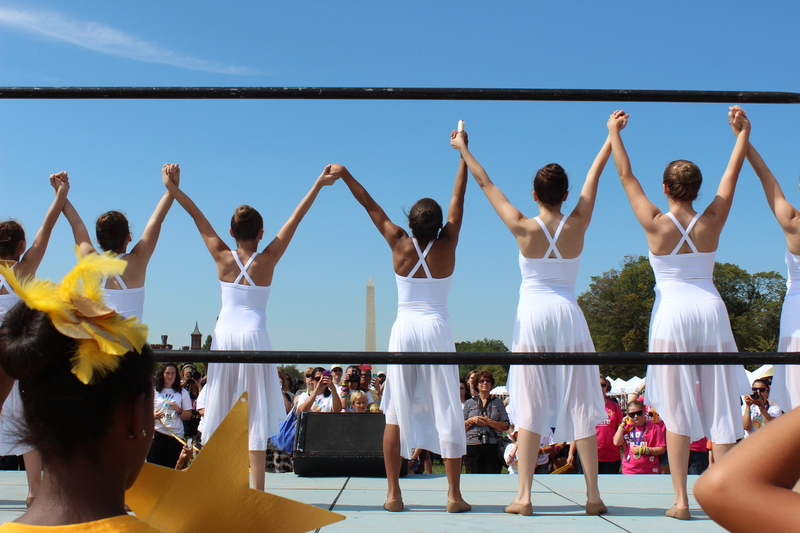 Dancers danced in honor and in memory of children fighting cancer. Here, dancers hug Delaney Clements after their performance. 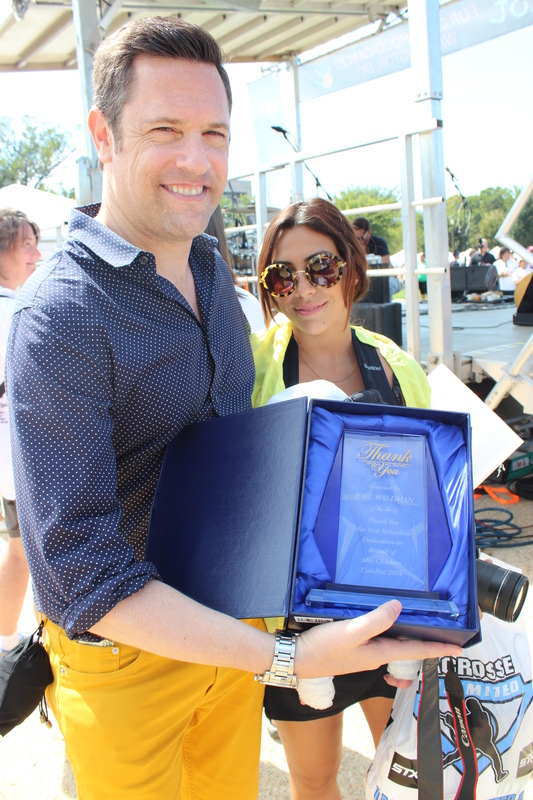 Joel Waldman, from Fox 5 NY, received an award of recognition and thanks for his outstanding work to bring awareness to childhood cancer. 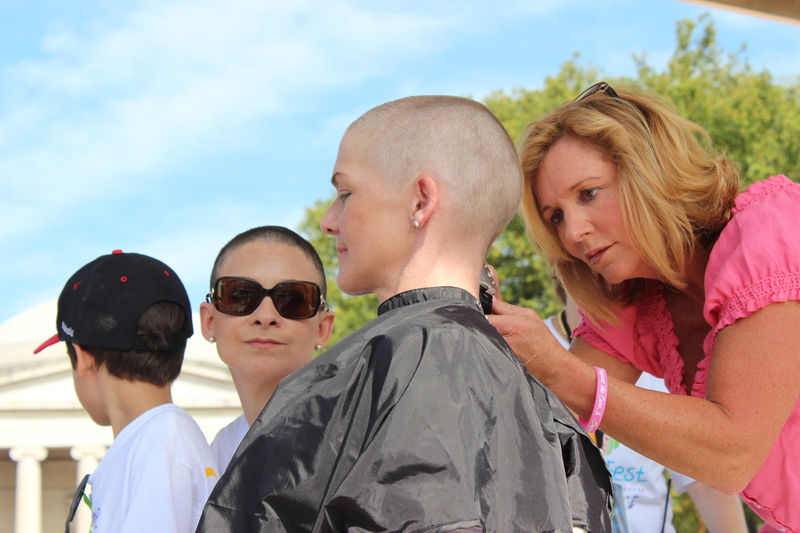 Gabriella Miller’s mom, Ellyn and Erin Griffin’s mom, Amanda, had their heads shaved at the event to bring more awareness to childhood cancer. Billy Sherwood, crazy-cute and courageous survivor, helping at his mom’s booth for Arms Wide Open Childhood Cancer Foundation. I remember– I will never forget– how much Melinda hurt inside when she was in the middle of her cancer battle and she was not able to dance. 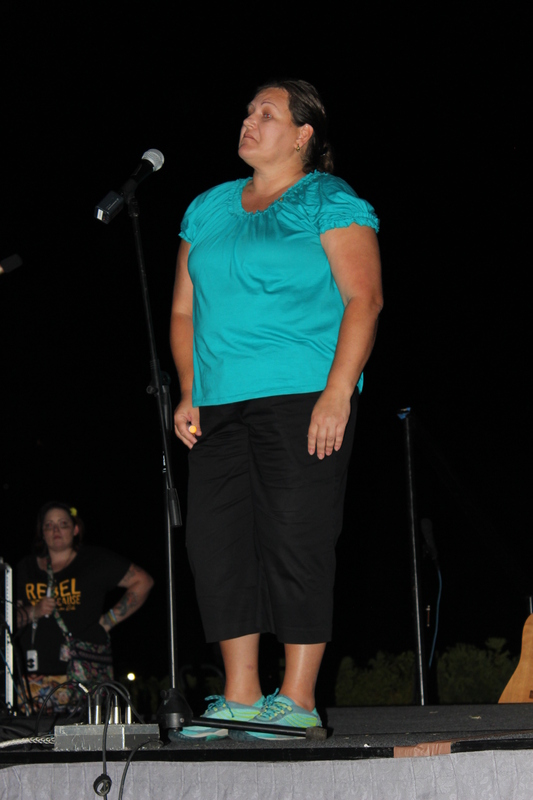 This moment at Curefest brought back memories of pain, and at the same time it crushed those memories with the victory I witnessed when Gabi Shull took the stage and danced. Oh my gosh! Beautiful Gabi! 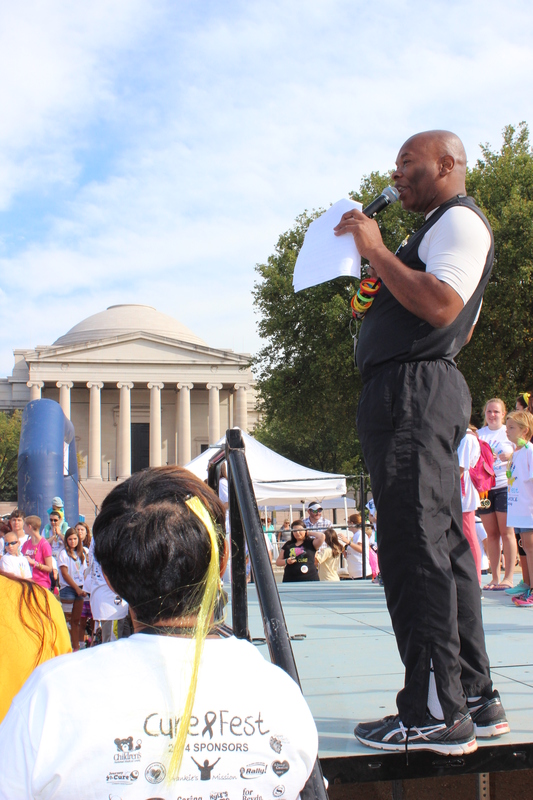 Thank you to Alvin Jones, Master of Ceremonies with a huge heart for the kids. 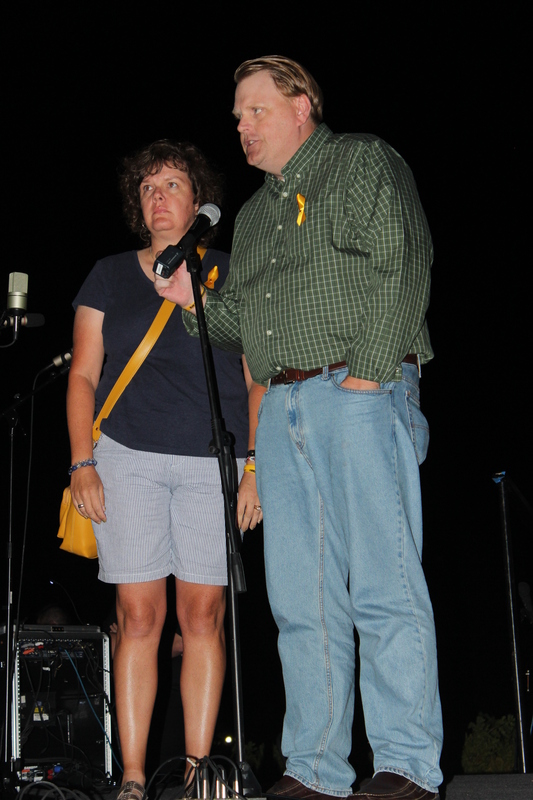 The man who is turning the world gold #WorldGoGold, Tony Stoddard (Cole’s Dad) stands with Amanda Griffin (Erin’s Mom). Like I mentioned at the beginning of this post, there is something epic about the setting of CurefestDC. Do you notice what is directly between Tony and Amanda in the photo above? 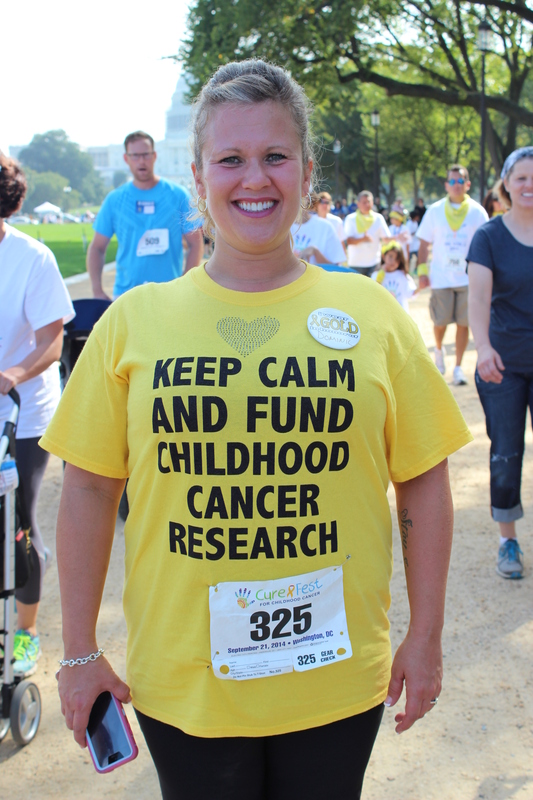 Hello, elected representatives, childhood cancer activists are more organized and more determined than ever before to have you listen to our One Voice to create change for childhood cancer. We need cures right now for all kids. It’s not okay to sit back, flap our gums and do nothing. CurefestDC gave all of us an opportunity to do something. I think CurefestDC inspired everyone who was present. 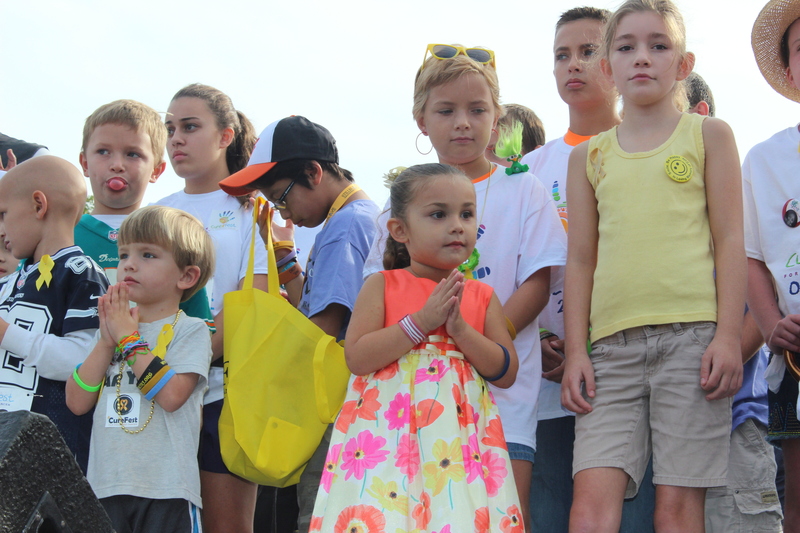 There is no greater cause than the health of our children. There is nothing like spending the weekend with people who know this is true. 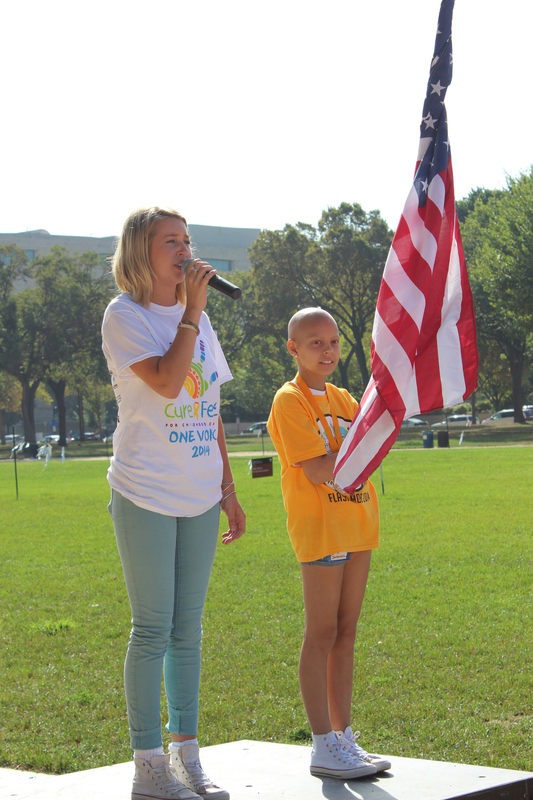 CurefestDC was one huge blast of hope and inspiration. Don’t worry, Gabriella, we’re going to do a LOT more than talk! After the Curefest DC Welcome Event at Nationals Stadium, the attendees all headed to President’s Park across the street from the front of the White House. I never would have arrived without the help of Karla, who introduced me to my very first ride on the Metro. Since I live in an area where there are rolling hills, oak trees, strawberry fields, and cows grazing, this was an eye-opening city experience for me. I know it’s normal for people who live in DC and other cities to travel on underground railways, but I admit that my usual Podunk surroundings make it so I am utterly amazed by the setting and all the people! Thanks Karla– I would still be standing in the station with my mouth open. Is it any surprise that A Night of Golden Lights is the brainchild of none-other-than Tony Stoddard? 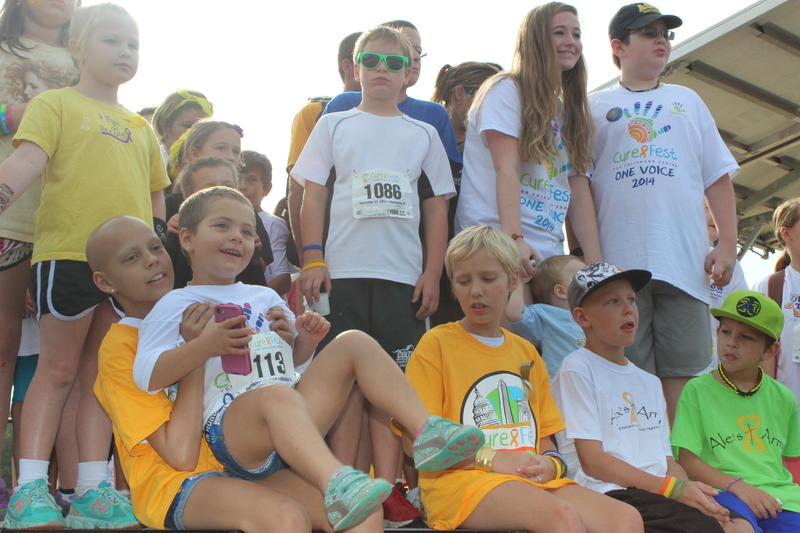 (A Day of Yellow and Gold to Fight Childhood Cancer) Our time together at this event was exceptional. I wish I knew the name of the singing group who sang “If I die Young” — it was beautiful! 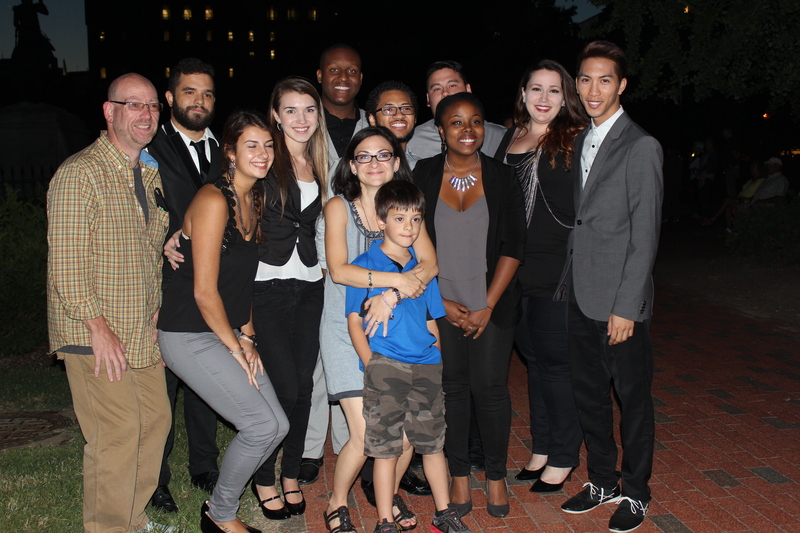 I do have this photo of the singers with Ellyn Miller (Smashing Walnuts Foundation) and her son. 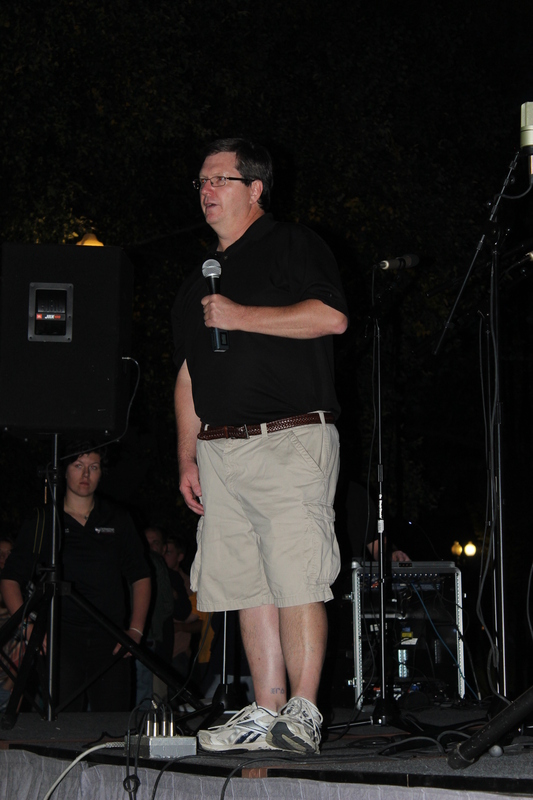 Mike Gillette, Emmy Award-Winning Filmmaker from The Truth 365, helped organize the evening’s events with Tony Stoddard. Thank you, Mike and Tony, for your never-ending passion and energy for the kids. 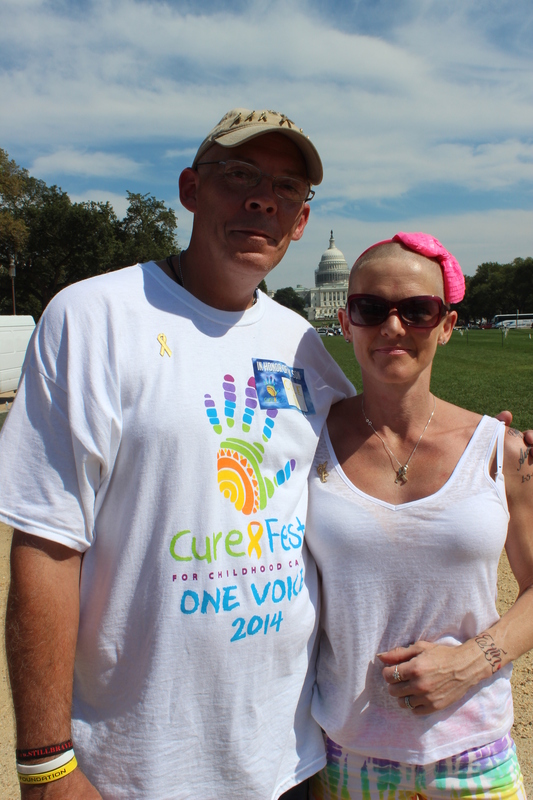 One of the most meaningful moments for me of Curefest DC came next. Tony began by telling us about his son, Cole. 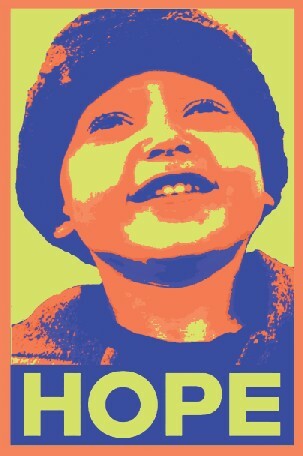 Cole died from Stage 4 Neuroblastoma. I highly recommend reading this article Tony wrote for Cancer Knowledge Network, telling his story. 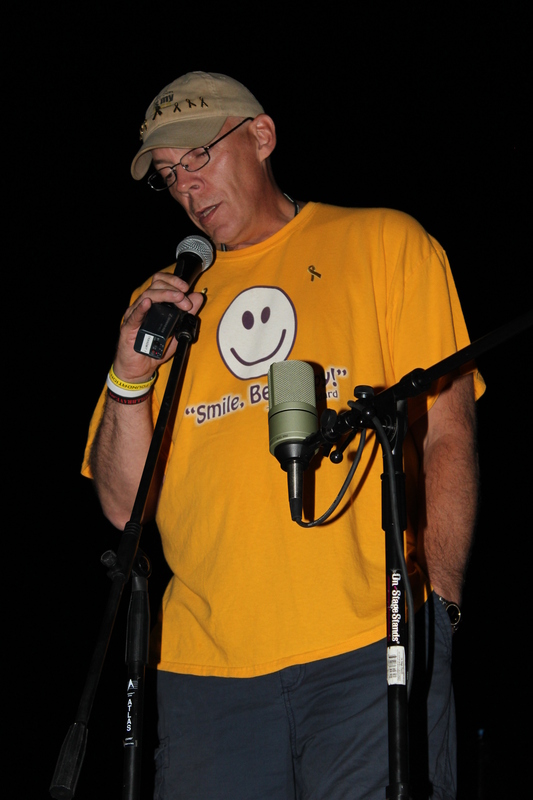 https://cancerkn.com/promise-son/ Being present to hear Tony tell his story is something I will always carry inside me, and what followed next will stay with me forever. 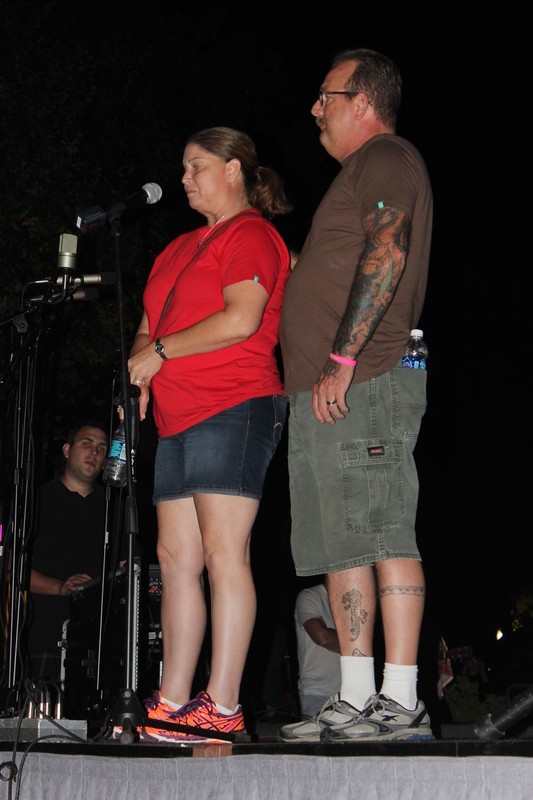 Parents and brothers and sisters took the stage to tell their stories. We need this. Giving these people a microphone and a caring, compassionate audience was beautiful. Each person who shared seemed comfortable that they were talking to a group who truly wanted to listen. We were all “family” on this night. We were all one. We were not separate. We were not alone. 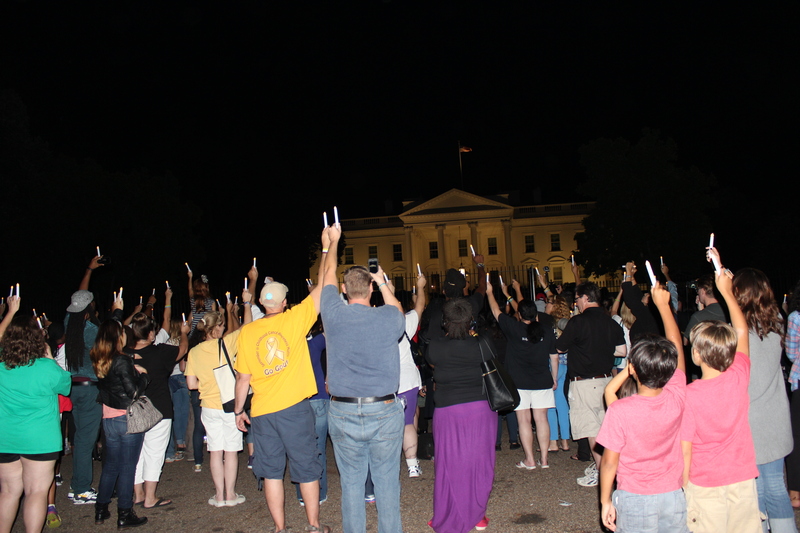 This tender and precious time of sharing set the tone for what we would do next… walk to the front of the White House. Slowly, almost somberly, the crowd began walking. I walked behind Tony, imagining what must be going through his mind and his heart. It was a time of reflection as our group neared our destination. If someone dropped a pin, we all would have heard it. It was a time of honor. It was a time of respect. It was a time of memory. It was a time of conviction that we need to do all we can to see that the pain and suffering present inside so many would not go without acknowledgement– would not wither without action or purpose. As we lit and lifted our golden lights together, we lifted our voices to sing, “Amazing Grace.” We sang the first verse through three times in a row. (Everyone chuckled when they announced we would do this because it is the only verse everyone knows!) 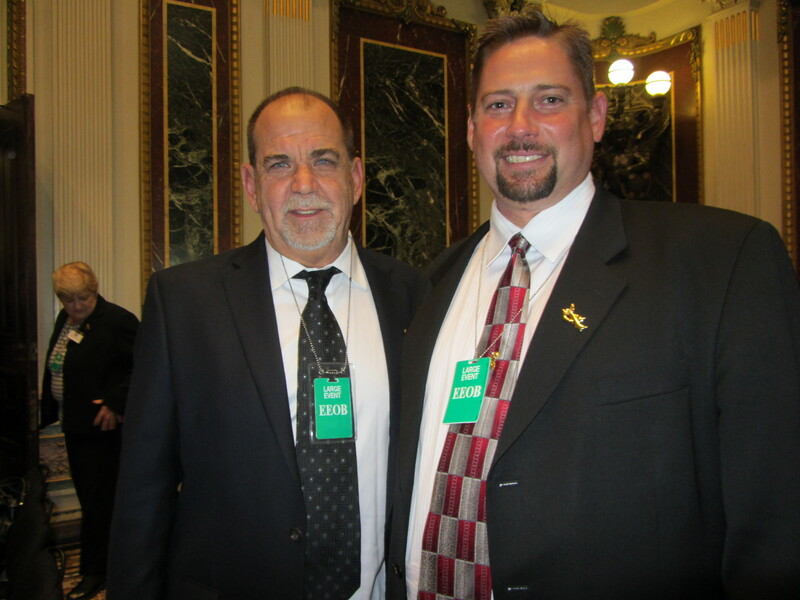 A Night of Golden Lights at the White House was an evening I will always remember. I was wishing our president was not vacationing, so he and his family could look out their window and see hope for children with cancer. My next thought was, “It doesn’t matter.” What matters is that all of these people gathered with One Voice for our kids. To be among these people is life-changing. Each person I met left a piece of their heart in mine. I hope I was able to leave them a warm piece of my heart as well. 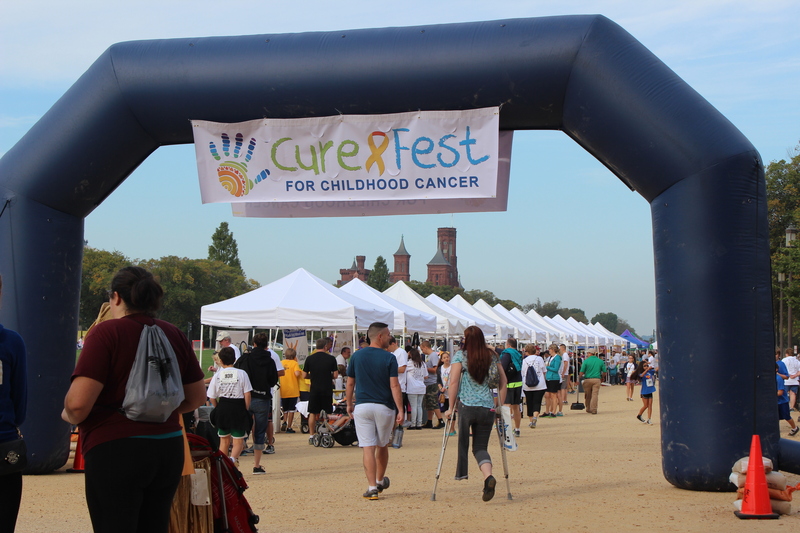 If you missed CurefestDC this year, you can always begin planning for next year’s event that will take place on September 19th and 20th, 2015. After attending this year, I find it is a must for me to begin planning on attending next year as well. 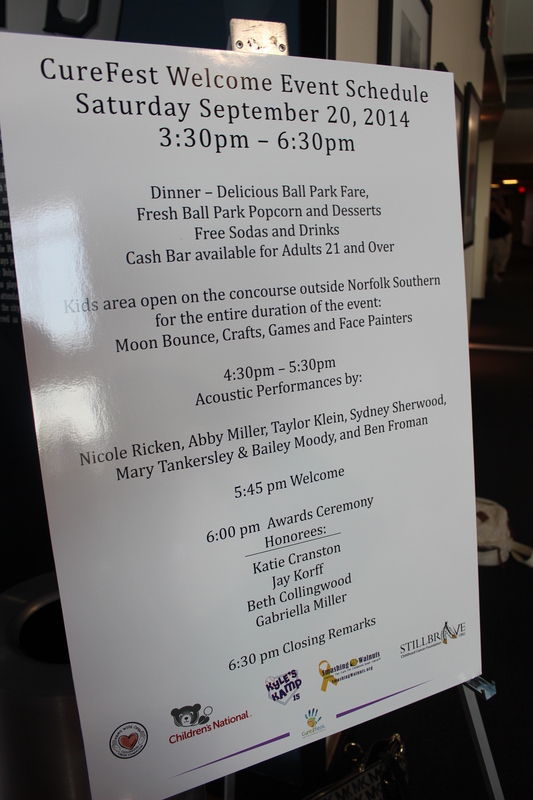 The Welcome Event was super-kid-friendly. Kids enjoyed a bounce house and lots of crafts and games. For some reason, they would not let me in the bounce house (ha ha!) This meant I needed to go back to the food table and eat an icing-topped cookie that looked like a baseball. Yum! 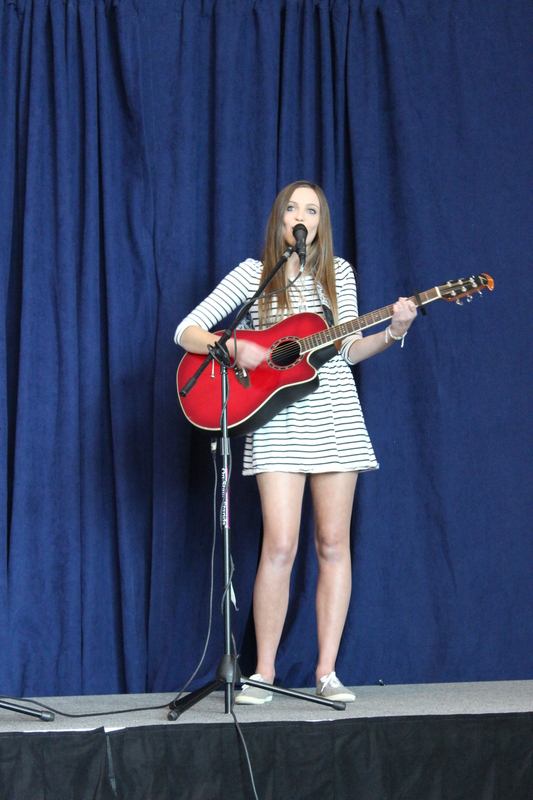 The entertainment was spectacular; I was happy to see and hear Nicole Ricken perform again and to see her sister, Alyssa as well. 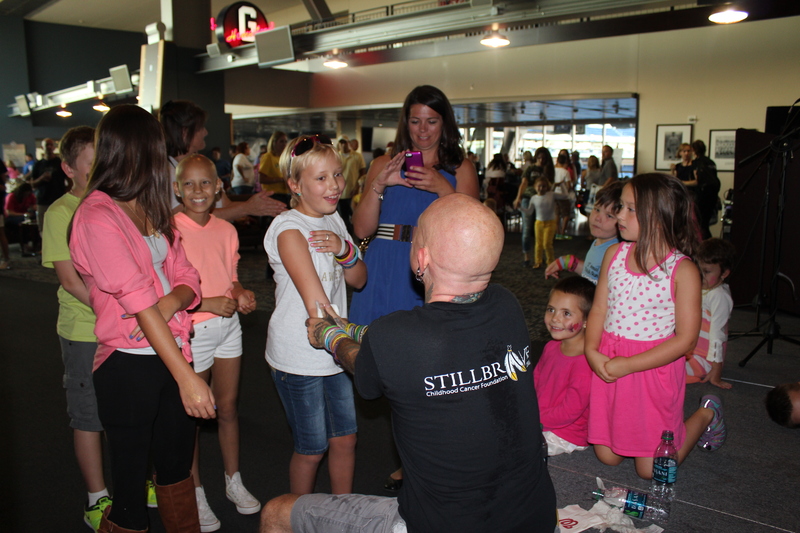 The fun went on and on, with Tattoo Tom Mitchell from Stillbrave Foundation spreading joy and tattoos. I am officially tagging Tom as a Kid-Magnet! The very best thing about the Welcome Event? 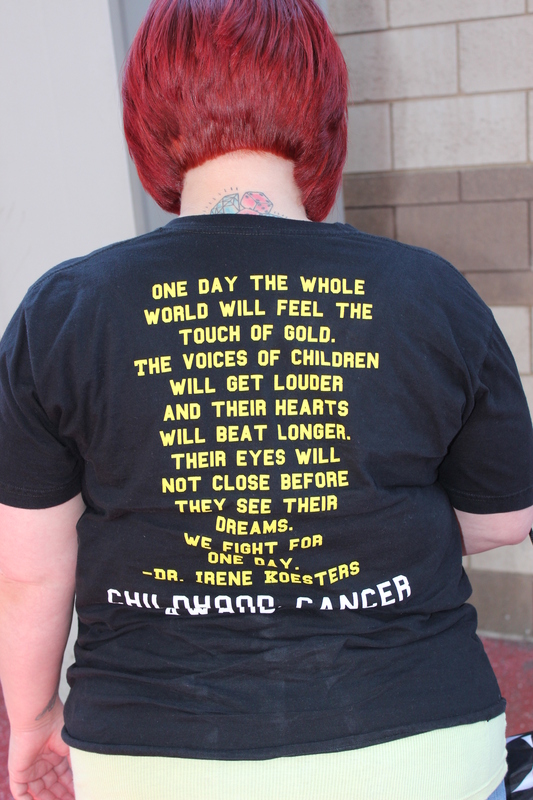 Voices for childhood cancer combined with action against childhood cancer. Know what? 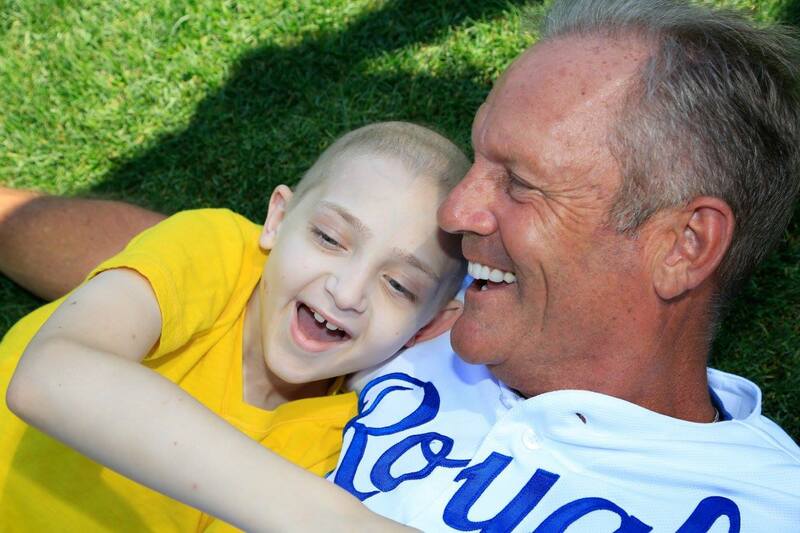 This is a deadly combination for childhood cancer. 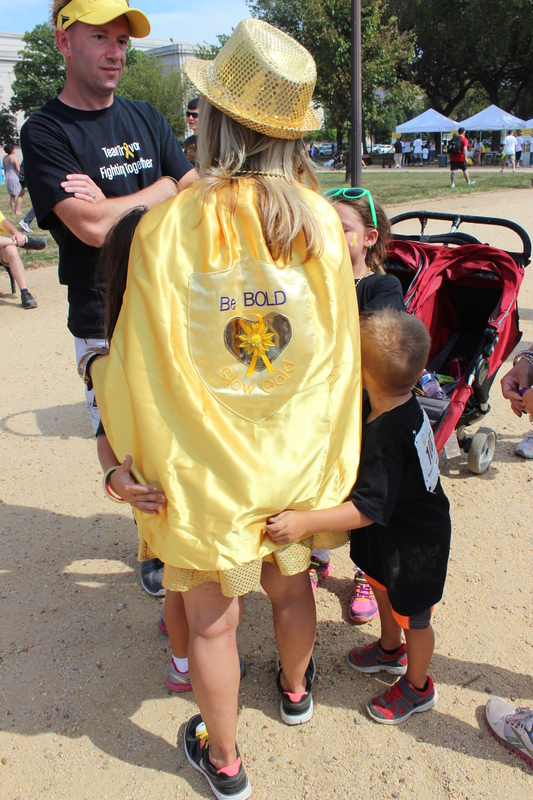 This September– this Childhood Cancer Awareness Month– is one that will be remembered as pivotal in the history of childhood cancer. 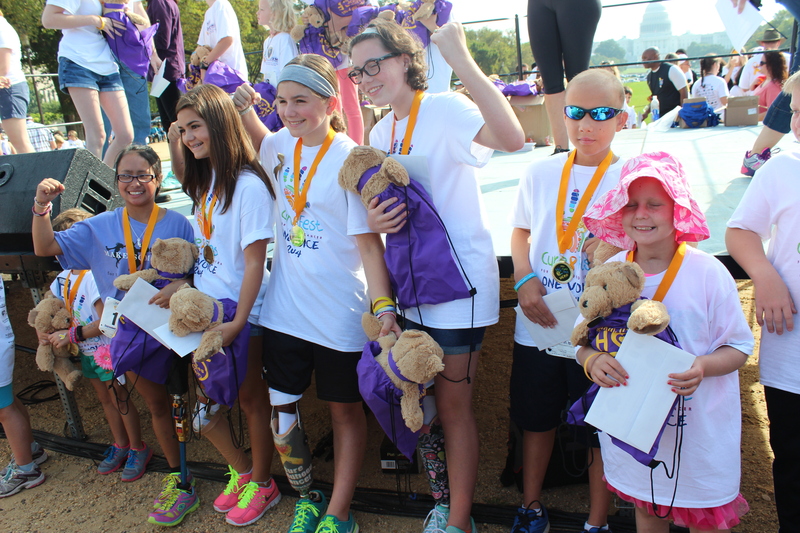 Because of the inexhaustible efforts of a few dedicated childhood cancer activists, last Friday, September 19, 2014, became a monumental step toward more funding and support for pediatric cancer research. 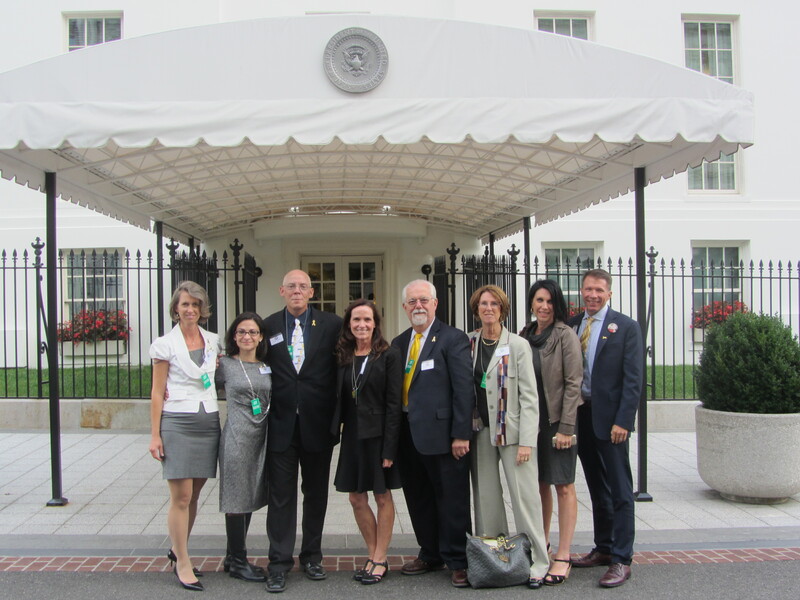 For the very first time in history, the White House Office of Public Engagement opened its doors with an invitation to a small group of childhood cancer advocates to attend a Briefing and Discussion with Pediatric Cancer Advocates. 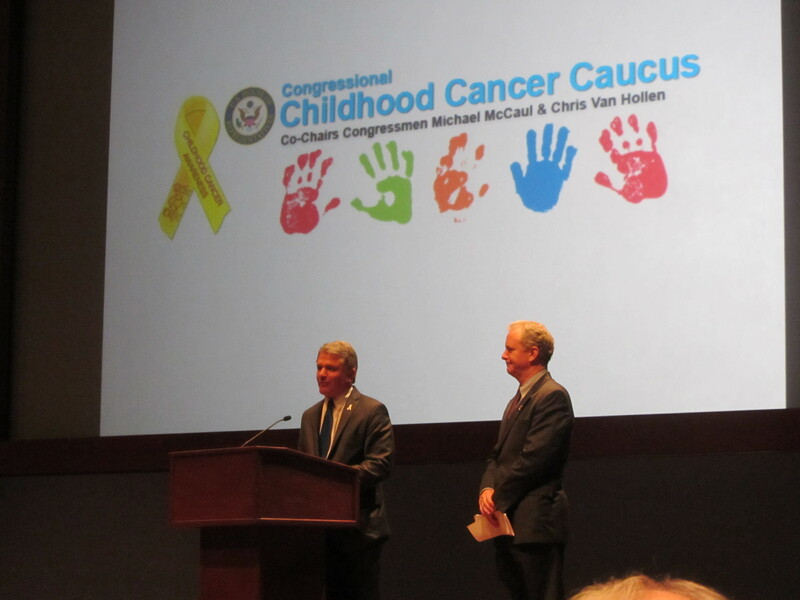 Prior to this meeting, I attended the 5th Annual Congressional Childhood Cancer Caucus, hosted by Co-Chairs Congressmen Michael McCaul and Chris Van Hollen in the Congressional Auditorium, Capital Visitors Center. 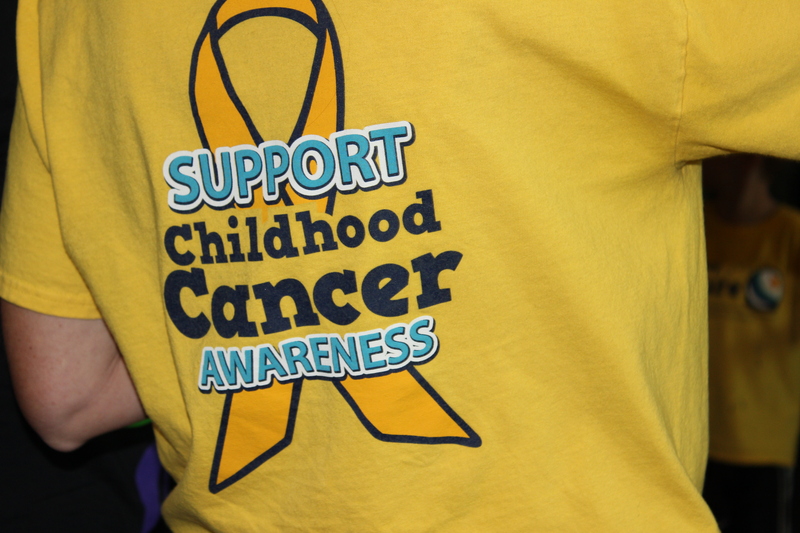 The mission of the caucus is to bring awareness to childhood cancer. Congressman McCaul spoke of his best friend in school who died from leukemia and the impact it has had on his life. He added that his wife is also passionate about the issue of childhood cancer. 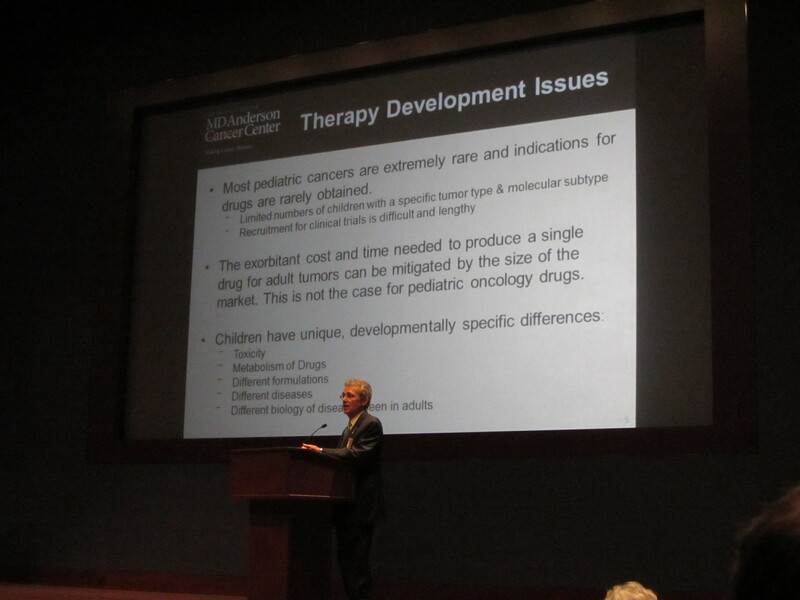 Congressman Van Hollen spoke next, encouraging all of us to come up with new ideas on how we can “tackle and defeat” childhood cancer in light of plummeting funding from the NIH in recent years. 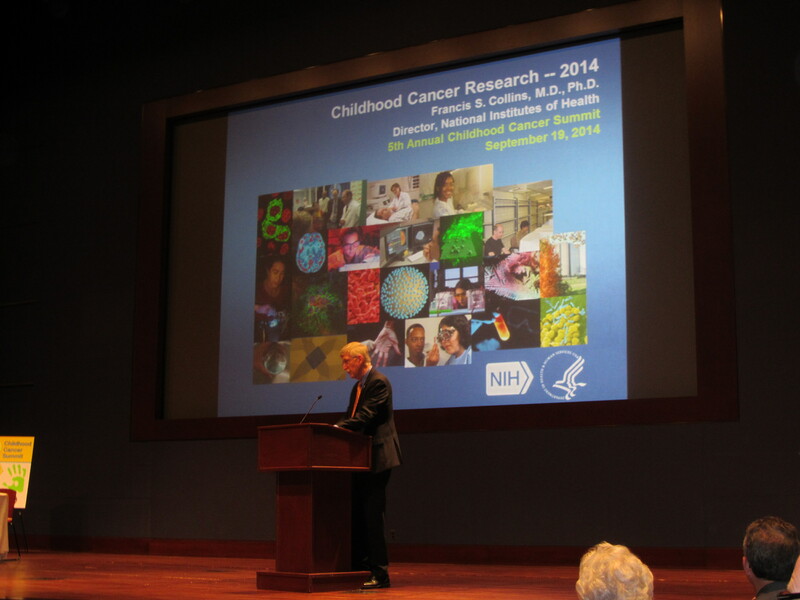 One of my favorite speakers of my entire time in Washington, D.C. was the next speaker at the Childhood Cancer Caucus. 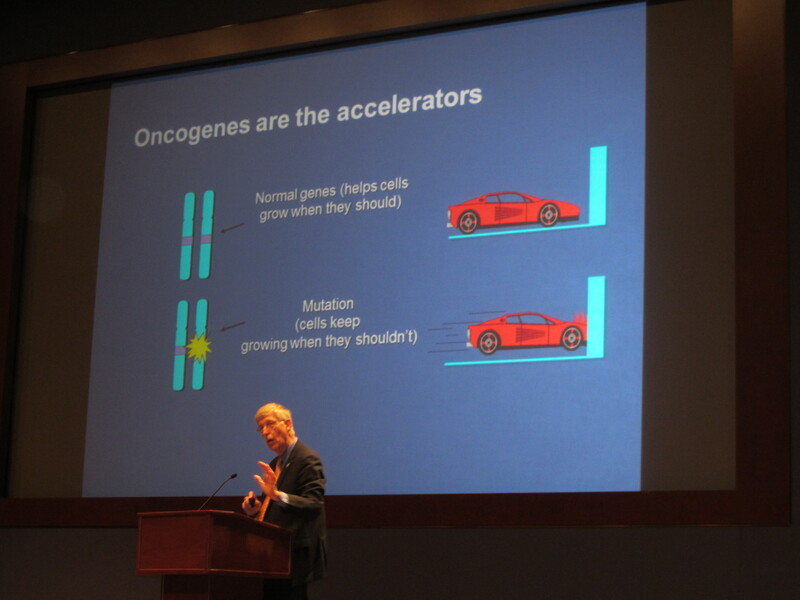 Dr. Francis Collins, physician, geneticist, respected scientist, and accomplished guitar player, spoke eloquently about how “exhilarated” he is by science and new things happening. His caring heart was clearly evident. He explained how cancer is a disease of the genome, or “misspellings in the DNA Instruction Book.” He added that every cancer is different which means every cancer needs individual treatment. 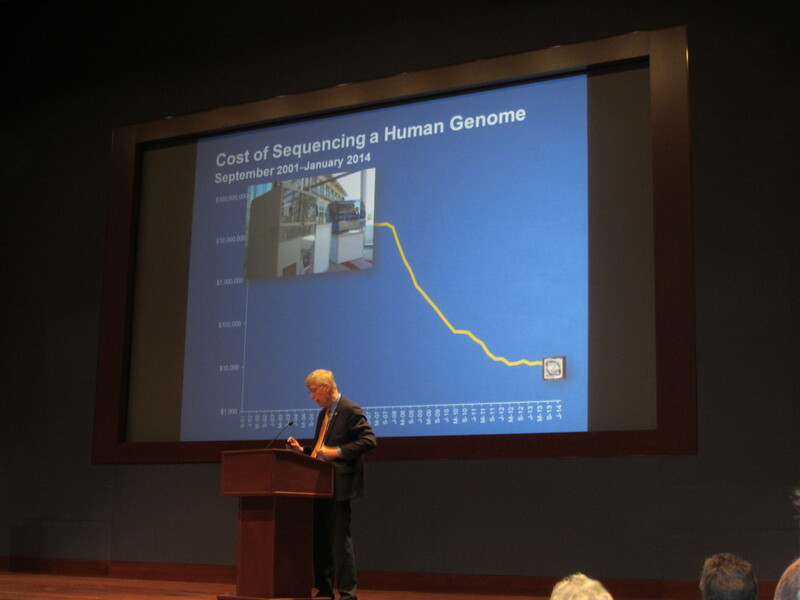 Further, he spoke about the Cancer Genome Atlas, TCGA-Pediatric Cancer Genome Project, TARGET, Oncogenes, how the cost of Human Genome Sequencing has dropped drastically, Immunotherapy, and the effects of the 23% funding cut to NIH. Scientists who are considering research in the field of pediatric cancer face the reality that only 16% of grant applications receive funding. This means we are chasing the best and brightest researchers away from childhood cancer research when we desperately need them! When we find a way to allow our brilliant, passionate scientists to perform their research without spending tons of their time writing grants that will never be funded, there will be great advances! I believe Dr. Collins when he says he will do everything he can. 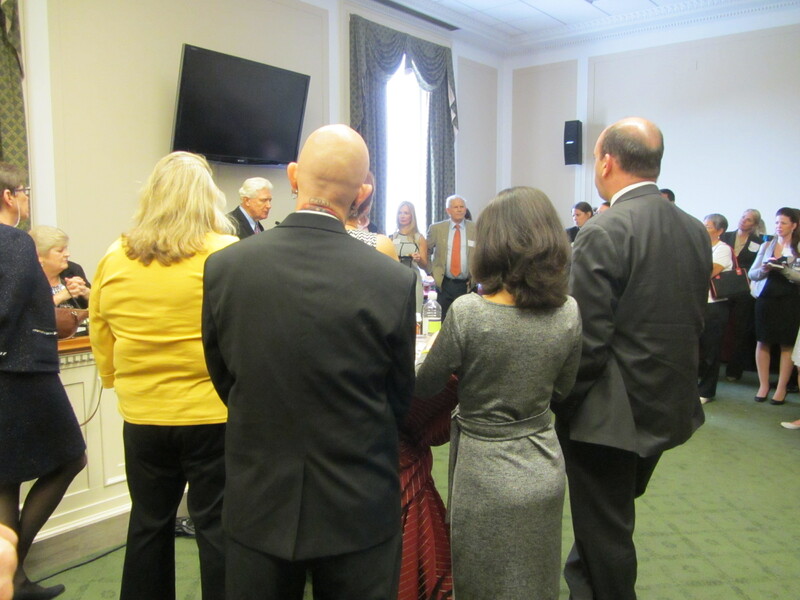 After the Caucus meeting, there was a luncheon to honor the Childhood Cancer Congressional Caucus in the Rayburn House Office Building. What an enjoyable time it was connecting with so many other advocates I have only known from communicating online! Post lunch, it was time to head to the White House. 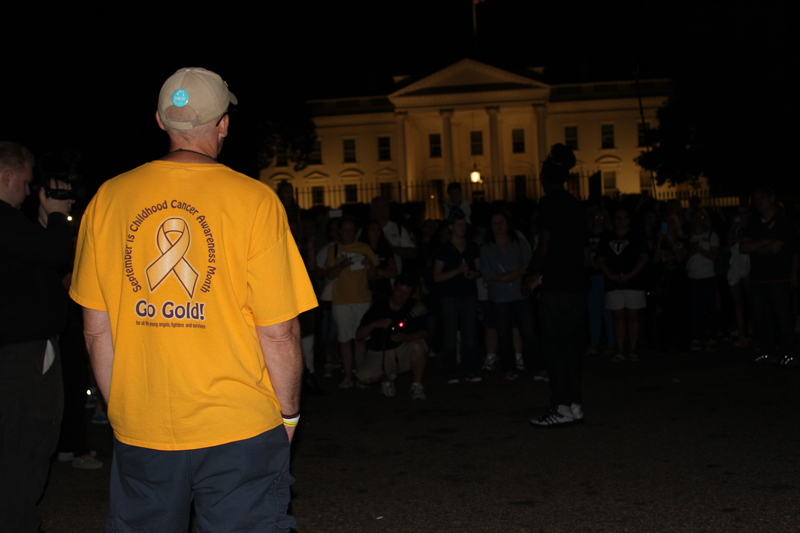 After a taxi ride with Ellyn Miller (Smashing Walnuts Foundation) and Tatto Tom (Stillbrave Foundation,) I met—for the very first time—Tony Stoddard (A Day of Yellow and Gold to Fight Childhood Cancer.) What it meant to me to look into this man’s eyes and thank him for all he has done and all he is doing cannot be expressed with our current English language. 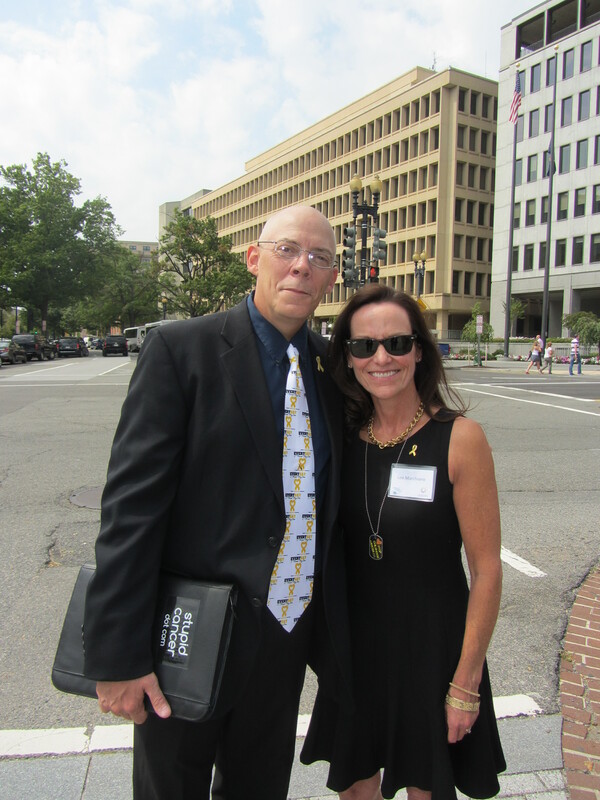 The meeting with the White House Office of Public Engagement would not have happened without this man’s passion to help children with cancer. What we truly need right now to be able to use the current forward momentum are collaboration and cohesiveness. As a community, we need to act, speak, and step as one. Our elected leaders in Washington, D.C. are beginning to hear our collective voice. 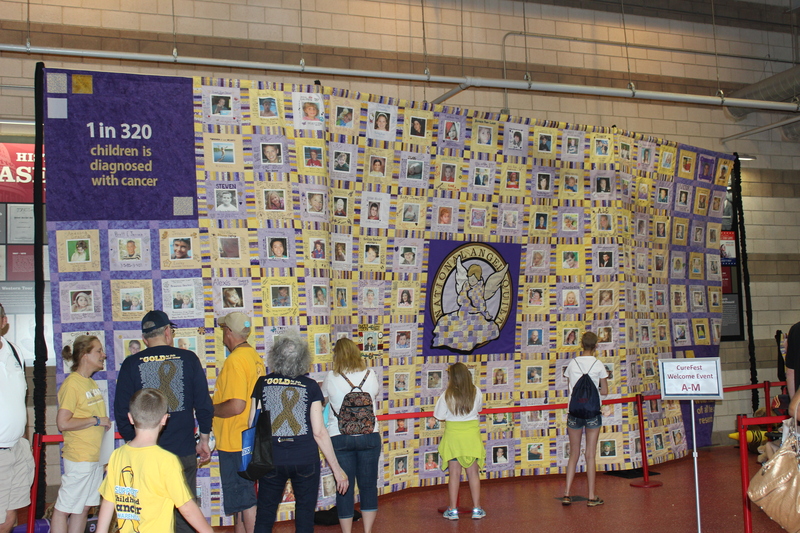 As Childhood Cancer Awareness Month winds down, and pink ribbons and bows begin their beautiful displays, we need to step up our advocacy and activist efforts. We need to recognize this moment of opportunity and seriously jump on it. It’s time for us to combine forces with industry, scientists, and advocates to create change. It’s time to abandon old, toxic treatments and usher in “Precision Medicine” that will heal and not harm our children. September 19, 2014 is a day I will always remember. 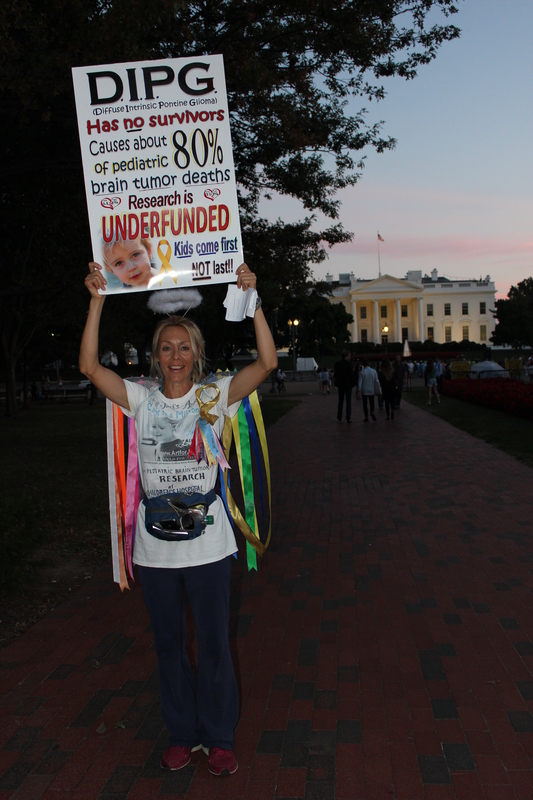 The doors of the White House opened to the needs of childhood cancer. I am greatly blessed to have been an invited guest on this historical day. With pleasure, I will sacrifice for cures for all children with cancer.